Bronchospasm and hyperventilation are not uncommon emergencies in the dental office. Additionally foreign body airway obstruction has occurred with patients aspirating and choking small dental devices. 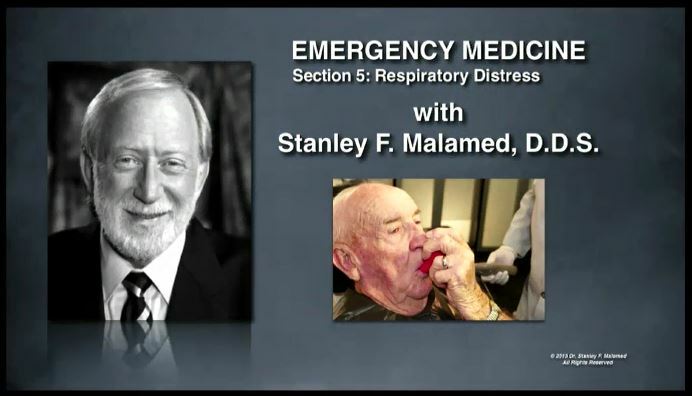 This program reviews the prevention, recognition and management of some common causes of respiratory distress. A conscious patient complaining of difficulty breathing forms the basis of this section on respiratory distress. The discussion includes four common causes of respiratory distress: bronchospasm (asthma); hyperventilation; heart failure & acute pulmonary edema; and foreign body airway obstruction (FBAO). Prevention, recognition and management of each problem is discussed in depth.